At today's Apple media event, Apple has also announced a new redesigned iPod touch 5. The 5th generation iPod touch has the same 4-inch Retina IPS display as the iPhone 5 and features an anodized aluminum back design which is available in a slew of beautiful colors never before seen on the iPod touch. It's also the thinnest and lightest iPod touch Apple has made coming in at 0.24-inches (6.1mm) thick aluminum enclosure and weighing only 3.10 ounces (88 grams). The all-black iPod touch 5 will feature a black exterior and glass display while the rest of the new colors will only be available with a white glass display. Hardware specs have obviously been much improved in this iteration of the iPod touch. The biggest improvements in the 5th generation iPod touch are the back facing iSight camera that now sports a larger backside-illuminated 5-megapixel camera sensor with LED flash capable of shooting full 1080p HD video with improved image stabilization and f/2.4 optics. Apple is certain the iPod touch's new improved camera will replace your pocket point-n-shoot. There's also a front facing 720p HD FaceTime camera. The performance has also seen a boost. The iPod touch 5's "new" dual-core A5 chip which combines both the CPU and GPU processors in one is said to offer seven times greater performance over last gen models. Battery life is rated for 40 hours of music, or 8 hours of video playback. The 5th generation iPod touch also features an arguably brilliant new color matching hand lanyard loop accessory that attaches to a metal button-like anchor that pushes up. Apple says the lanyard loop will provide a more secure hold of its handheld gaming and media device. We must say, it certainly looks a lot better than it actually is useful as far as hand lanyards go. 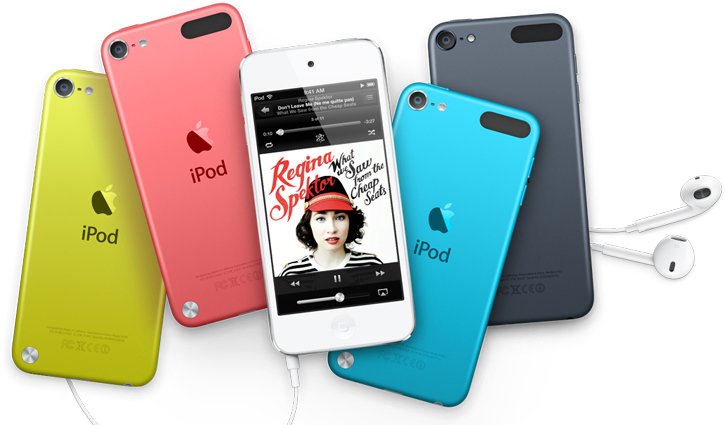 Apple's iPod touch 5 will come bundled with the new EarPods and will be available in five colors at 32GB and 64GB capacities for $299 and $399, respectively. Pre-orders open up on September 14th but will only start to ship in October.